I’ve been reading Christina Dodd’s books for almost twenty years. I started with A Well-Pleasure Lady back in 1997, and I have followed her to romantic suspense and paranormals even though I rarely read in those subgenres. But her historicals are my favorites, and her Governess Brides books are my favorites among her historicals. I was delighted this fall when Avon began reissuing digital copies of the series with delicious new covers. So far only the first four in the series have been reissued, but I am hoping others will follow. The seventh book, My Favorite Bride, although available in digital format, is in desperate need of an updated cover. When I considered the Governess Brides for an On Second Thought column, I could not choose just one; but neither could I do justice to eleven books in a single column. My solution was to focus on my three favorites in the series. Jane’s plan when she returns to London is to stay strictly in the background, but Ransom is bent on revenge. He is also a spy who thinks Jane is involved in nefarious activities. He hasn’t really matured much in eleven years and behaves just as reprehensibly this time as he did regarding that scandalous evening. Nobody creates heroes readers love to hate better than Christina Dodd, and she is at the top of her game with Ransom. I love Jane, and the book has some stellar secondary characters. BUT what makes this novel one of my favorites is that it has what may well be the best grovel scene in historical romance. There is no mere posturing here but a real change in the power structure of the relationship. Good for Jane! More than the heroine’s name may bring Jane Eyre to mind when reading this book. Rules of Attraction is the fourth book in the series, and it offers Dodd’s take on the traditional Gothic. Heroine in a desolate, foreboding setting, check; dark ominous hero who is suspected of murdering his wife, check; secrets, sinister secondary characters, danger, check, check, and check. All these Gothic elements are in place. However, Hannah Setterington is no Gothic heroine ensorcelled and controlled by the hero, and she knows the hero is no murderer because she is the Earl of Raeburn’s missing wife. Hannah and Dougald are considerably more complex than the typical leads in Gothic romance. It is not the plot of an endangered beauty that drives this story; rather, the story is driven by these two layered characters who have a complicated past. Hannah ran away, taking a great risk, but she founded the Distinguished Academy of Governesses and made it a success. It is quite a shock when she discovers Lord Raeburn is Douglas Pippard, her husband, but she deals with it. The danger is real. The two previous earls have been murdered, and Dougald is next in line. The darkness of the threat does not prevent the reader’s enjoyment of the witty sparring between the H/H. I had a tough time choosing between this one and Rules of Surrender, which I also love, but I read Gothics by the shopping bagful in my day and thus loved the Gothic twist, so ROA had an edge. 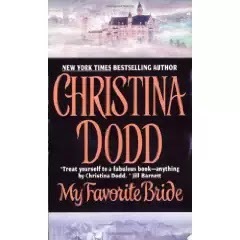 My Favorite Bride is the seventh Governess Brides book and a tie for my favorite Dodd book. * I love that Dodd unabashedly admits that the book is her tribute to The Sound of Music from which she borrowed the plot. I have a weakness for the spirited heroine paired with a stuffy hero and for the taming of the kids thread, so this book works for me on many levels. Samantha Penderegast was once the most famous—or infamous--pickpocket in London until six years ago when Adorna, Lady Bucknell (who appears in That Scandalous Evening & Rules of Surrender) rescued her from a life of crime and prepared her to become a governess. The problem is Samantha may have learned how to speak and how to dress, but she did not learn how to control her temper when she perceives injustice being done. She lost her most recent job when she ended her employer’s browbeating his young son by informing his wealthy wife of his mistress (which prompted the wife to take her son and return to her father’s home) and by persuading the mistress to dump him. Her irate former employer is doing his best to destroy her reputation in London, so Adorna sends her far from London to Cumbria where Colonel William Gregory needs a governess for his six daughters, daughters who have managed to dispose of no fewer than eleven governesses. Colonel Gregory is a martinet who treats his daughters as if they were young recruits. He does understand that they need a mother, but he is convinced that they need the “proper” mother, so even when Samantha wins over all the young hellions and the chemistry between Sam and the colonel is so heated it is practically melting the mansion’s walls, he plows ahead with his plan. He proves himself even more of an idiot when he verbally annihilates Samantha. But trust La Dodd, he gets his comeuppance. There are many endearing scenes with the children, and the “other woman” here is a major improvement on the original. Lady Teresa Marchant truly is a character, not merely a stock image. William confronts his error in a convincing manner, the bad guys are defeated, and HEAs proliferate. Every time I reread this book, I finish it with a smile. I highly recommend all three books. I plan to reread the full series, and I’m keeping my fingers crossed that My Favorite Bride gets one of those sigh-worthy covers soon. * The Greatest Lover in All England, a rare Elizabethan romance with a chick-in-pants heroine, the titular hero, Hamlet, Shakespeare, and a royal blessing on the HEA, is my other favorite. Looking back through my files for this series I highly rated #2 Surrender, #3 Engagement and #8 fair temptress. Curiously Janga, I didn't read any of your listed favourites #4 Attraction, #7 favourite bride and #1 Scandalous evening. I'm going to remedy that ASAP!! Hi, Q! I miss talking books with you. Rules of Engagement would have been #4 had I included one more, but I had some problems with Wynter in Surrender, even though I love Charlotte and Adorna. I think every book in the series has something that makes it an interesting read. I hope you enjoy my faves. This was my favourite, too. Completely unique, too! I agree about Dodd's humor, Hellie. And she was writing sizzling love scene before the current trend for added heat made such scenes the expected thing. I don't think you can go wrong with any of her stories! I think you are right, catslady. Thank you, Janga! I'm honored by your comments. I've always said I write what I like to read, and I've been re-reading my historicals. The good thing frequently is — I don't remember what happened exactly so events come as a surprise. LOL I find that sometimes rereading favorites too, particularly if it has been several years since my last reading. Thank you for all the hours of reading pleasure, Christina, and for stopping by TRD. I stash all the Christina Dodd books I can on my keeper shelf. Some I have read, but many are waiting. I will have to check for these three and get to them sooner than later. Sorry, but I am a bit old fashioned when it comes to the covers. I really like the originals. The current trend of men who can't seem to button their shirts is getting a bit boring. But again, tastes differ and lots of people like those. I agree that the shirtless wonders are overdone, Pat, but these are exceptional and they seem to fit Christina's books.